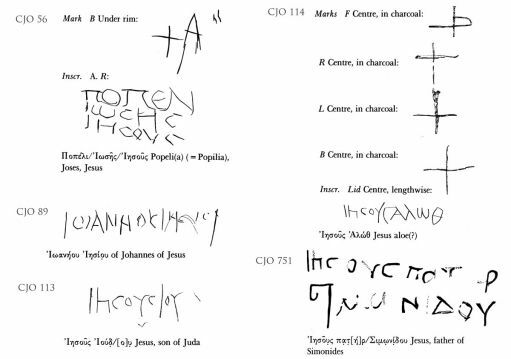 BlogHome » Blog » More Jesus inscriptions, more from Talpiot, more with crosses. However, in the film “The Lost Tomb of Jesus”, the cross takes on quite a symbolic role. Although the filmmakers make an effort to disconnect the symbol from the crucifixion, it nonetheless provides, in their interpretation, the symbol for an early religious act of “sealing” of the followers of Jesus. The film then depicts disciples being marked with a cross on their foreheads. The cross is shown glowing on the ossuary, next to the name “Yeshua’ (?)”. However, upon closer examination, point for point, this statement appears to be nothing more than amateurish nonsense. 1. 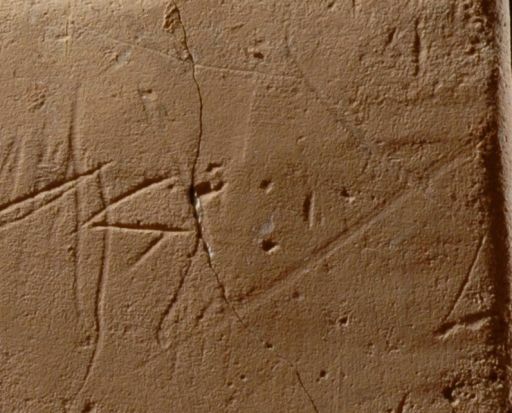 The width, depth and scoring marks within each stroke are clearly different from those of any of the lines of the inscription. In fact, it is not even clear that the two strokes of the X were made by the same tool (or any tool for that matter). It is questionable whether these lines are anything more than accidental scratches. 2. Pellegrino’s pointing to the “mineral vaporization” (according to actual professionals who work in the area, the use of this term, as it is used here, is nothing more than “pseudo-professional jargon”, a stilted and inappropriate substitution for the normal word “patina”) doesn’t help his argument, since virtually all scratches on this ossuary—at least 100 in count—have patina deep within them. There are at least five more ossuaries which bear the name “Jesus”, not in Hebrew but in Greek. There are at least three other examples(CJO 56, 113 and 114) of the name “Jesus” on ossuaries with cross-marks. In fact, two of these (CJO 113 and 114) were found in a single tomb in Talpiot (but in 1946). Moreover, these same two appear in the film sitting on the table in the examination room at Beth Shemesh with the other ossuaries (one is labeled “46.173” and the other, 46.174 is inscribed with carbon crosses). We are surprised that there is no mention of these ossuaries in the film or the book. One of these, CJO 56 bears an “A”(alpha) with the cross-mark. The filmmakers could have better used this ossuary to bolster their story, as they stated: “In the book of Revelation, Jesus declares, ‘I am the Alpha and Omega, the first and the last, the beginning and the end.’ Alpha and omega are the first and the last letters in the Greek alphabet. Jesus would have declared, ‘I am the Aleph and the Taw’, as he spoke in Aramaic. And in his time, the symbol ‘taw‘ was drawn as a cross.” It is almost as though the narrator was referring to this ossuary and not to the one in the other tomb. Also, the name IOSHS (Joseh), just as it is spelled in the New Testament, appears on this same ossuary CJO 56 along with the name “Jesus”. Remember, Joseh was the name of one of Jesus’ brothers! “Could this come from the tomb of Jesus family?” (Too bad that a certain Popelia is mentioned as part of the family as well!) This question has been asked many times before concerning this and the other ossuaries. The multiple and frequent occurrences of these names and symbols merely underscores the relative abundance of these names. The cross and the X were used interchangeably as a mark on ossuaries. Also these marks were, by far, the most common found on the ossuaries. Of the 895 ossuaries in the Catalogue of Jewish Ossuaries, Rahmani presents drawings of at least 46 with cross-marks. Twenty-six of those were found in pairs with the cross appearing on both the lid and the edge of the stone boxes. In these cases, their function was to indicate the direction that the lid was to be placed during the reinterment ceremony. In all of these cases, the marks were apparently functional with no symbolic or religious significance implied at all.